can give tsunamis a critical boost. A new NASA study (published in Journal of Geophysical Research -- Oceans) is challenging a long-held theory that tsunamis form and acquire their energy mostly from vertical movement of the seafloor. An undisputed fact was that most tsunamis result from a massive shifting of the seafloor -- usually from the subduction, or sliding, of one tectonic plate under another during an earthquake. Experiments conducted in wave tanks in the 1970s demonstrated that vertical uplift of the tank bottom could generate tsunami-like waves. In the following decade, Japanese scientists simulated horizontal seafloor displacements in a wave tank and observed that the resulting energy was negligible. This led to the current widely held view that vertical movement of the seafloor is the primary factor in tsunami generation. The animation shows how waves of energy from the Tohoku-Oki earthquake and tsunami of March 11, 2011, pierced through into Earth's upper atmosphere in the vicinity of Japan, disturbing the density of electrons in the ionosphere. These disturbances were monitored by tracking GPS signals between satellites and ground receivers. A model of ocean tsunami wavefronts [Song, 2007] is overlaid in blue to show the correlation between variations in the ionosphere above and ocean surface below. Note that traveling ionospheric disturbances (TIDs), visible throughout the animation, are correlated with the position of the tsunami. In 2007, Tony Song, an oceanographer at NASA’s Jet Propulsion Laboratory in Pasadena, California, cast doubt on that theory after analyzing the powerful 2004 Sumatra earthquake in the Indian Ocean. Seismograph and GPS data showed that the vertical uplift of the seafloor did not produce enough energy to create a tsunami that powerful. But formulations by Song and his colleagues showed that once energy from the horizontal movement of the seafloor was factored in, all of the tsunami’s energy was accounted for. Those results matched tsunami data collected from a trio of satellites –the NASA/Centre National d’Etudes Spatiales (CNES) Jason, the U.S. Navy’s Geosat Follow-on and the European Space Agency’s Environmental Satellite. Animation of ‘The Earth’ - modelling tsunami waves propagating over the globe. With a resolution of 3km and a time step of 1 min, we brought together 10 previous tsunami events in 24 hours - in less than 5 hrs on 36 cores. The model shows (in order of appearance and triggered every 2 hours): Solomon Islands 2007, Tohuku 2011, Sumatra 2004, Makran/Balochistan 1945, Greece 1956, Lisbon 1755, Dominican Republic 1946, Ecuador/Colombia 2016, then Tohuku 2011 and Valvidia 1960 (simultaneously) and Kamchatka 1952. His search for more proof rested on physics -- namely, the fact that horizontal seafloor movement creates kinetic energy, which is proportional to the depth of the ocean and the speed of the seafloor's movement. After critically evaluating the wave tank experiments of the 1980s, Song found that the tanks used did not accurately represent either of these two variables. They were too shallow to reproduce the actual ratio between ocean depth and seafloor movement that exists in a tsunami, and the wall in the tank that simulated the horizontal seafloor movement moved too slowly to replicate the actual speed at which a tectonic plate moves during an earthquake. To put his theory to the test, Song and researchers from Oregon State University in Corvallis simulated the 2004 Sumatra and 2011 Tohoku earthquakes at the university’s Wave Research Laboratory by using both directly measured and satellite observations as reference. Like the experiments of the 1980s, they mimicked horizontal land displacement in two different tanks by moving a vertical wall in the tank against water, but they used a piston-powered wave maker capable of generating faster speeds. They also better accounted for the ratio of how deep the water is to the amount of horizontal displacement in actual tsunamis. 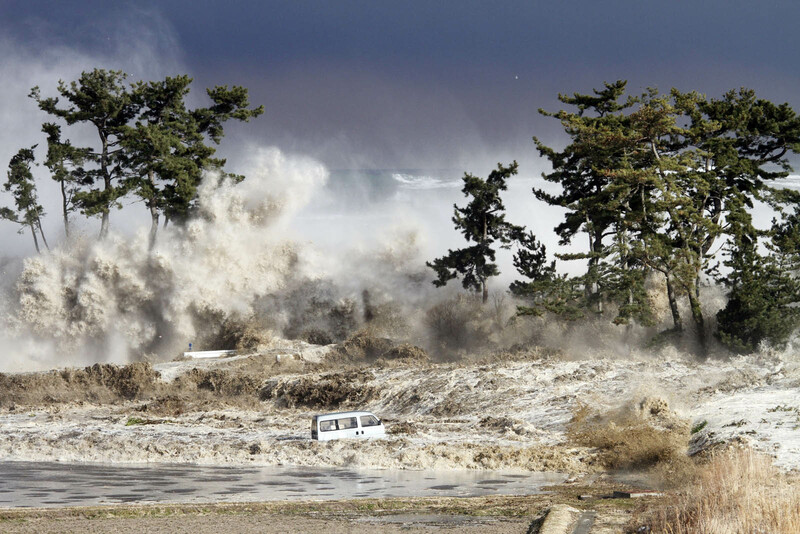 Photo taken March 11, 2011, by Sadatsugu Tomizawa and released via Jiji Press on March 21, 2011, showing tsunami waves hitting the coast of Minamisoma in Fukushima prefecture, Japan. The JPL-managed Global Differential Global Positioning System (GDGPS) is a very accurate real-time GPS processing system that can measure seafloor movement during an earthquake. As the land shifts, ground receiver stations nearer to the epicenter also shift. The stations can detect their movement every second through real-time communication with a constellation of satellites to estimate the amount and direction of horizontal and vertical land displacement that took place in the ocean. They developed computer models to incorporate that data with ocean floor topography and other information to calculate the size and direction of a tsunami. 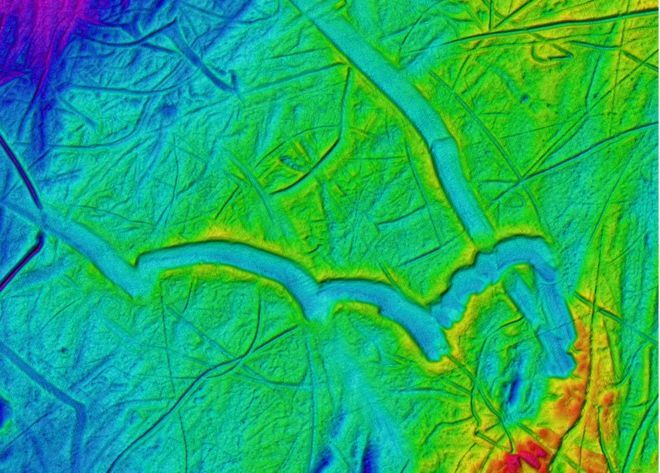 “By identifying the important role of the horizontal motion of the seafloor, our GPS approach directly estimates the energy transferred by an earthquake to the ocean,” Song said. It is as if a child has been doodling with large coloured crayons. 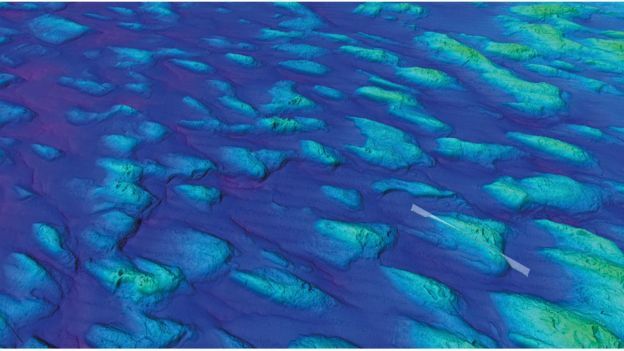 What you see are actually the great gouge marks left on the seafloor when the keel of a giant block of ice has dragged through the sediments. The arcs and loops record the movement of the berg as it turns about, caught in the wind, currents and tides. 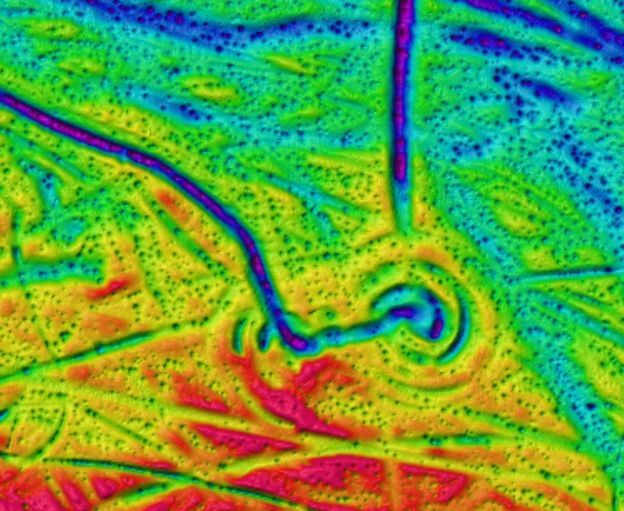 This "ice art" is from a stunning new collection of images that detail how glacial action has shaped the ocean floor in Earth's polar regions. 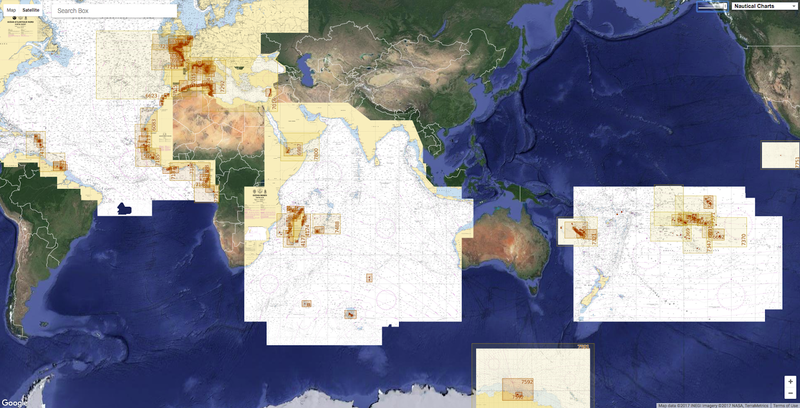 The atlas is the work of more than 250 scientists from 20 countries and represents our most comprehensive view yet of what the seabed looks like at high latitudes. 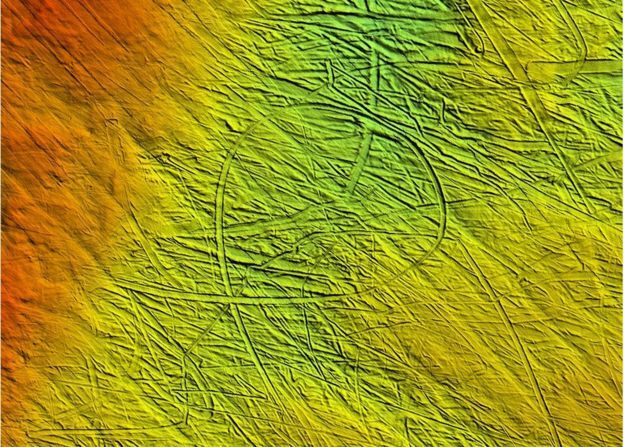 "We now have a critical mass of high-resolution imagery, of the imprints left by the action of ice," explained Dr Kelly Hogan, one the collection's editors from the British Antarctic Survey (BAS). "We can see where the ice has been and what it's done, and this allows us to compare and contrast. Looking at what has happened in the past can help us understand what may happen in the future with modern ice sheets as they respond to climate change." In the most extreme places in the world, the most remarkable people gather scientific evidence about our changing planet. From the discovery of the hole in the ozone layer, to the effects of climate change, the polar regions act as early warning systems. 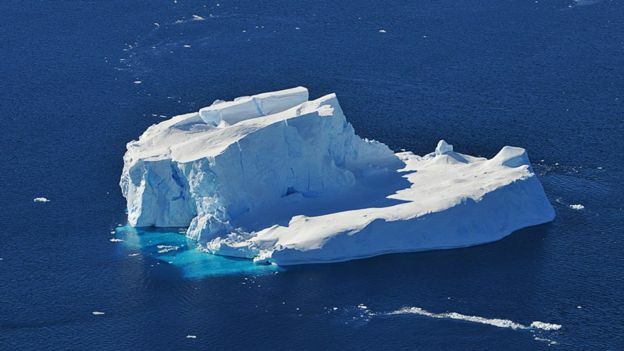 With the help of the British Antarctic Survey, governments and world leaders have been able to use the evidence gathered to make better decisions for the future of the Earth. The book, published as a "memoir" of the Geological Society of London, has taken four years to put together. 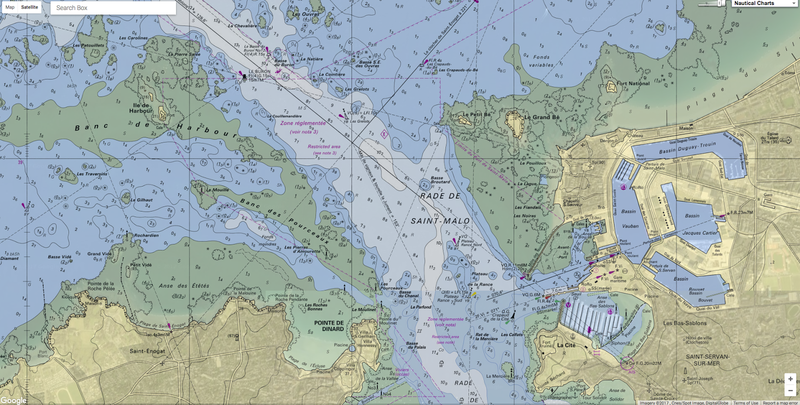 It contains mostly images produced from ship echosounders, which pulse the ocean bed and then build depth maps from the resulting return signal (the "false colours" will usual denote different depths). A first version of the book came out in 1997, but comprised really only low-resolution data. The new tome, on the other hand, benefits from 20 years of multibeam swath technology, which is capable of creating spectacular perspectives of the ocean floor, often at sub-metre resolution. All ships now entering polar waters will routinely map the bed in this way. An almost circular iceberg plough mark off Svalbard. "Today's icebreakers and ice-strengthened vessels all carry these high-res systems; they are standard. No longer do we get just single points, but a whole fan of sound goes down to the seafloor to collect 3D data. And we're finding all these weird and wonderful features," Dr Hogan told BBC News. As well as the iceberg ploughmarks, there are the classic forms left by marine glaciers. These include long striations, drumlins (egg-shaped mounds) and moraines (bulldozed sediment ridges). 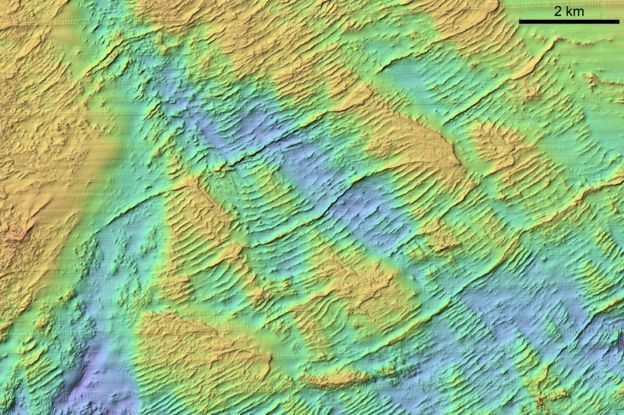 "When the moraines are pushed close together, they're most likely annual features, but move a bigger distance offshore and you might find moraines that are from thousands of years ago and are spread further apart. We could go date the sediments to look at how quickly ice has retreated. So, this gives you an idea of how we can use the imagery to help us understand what is going on." 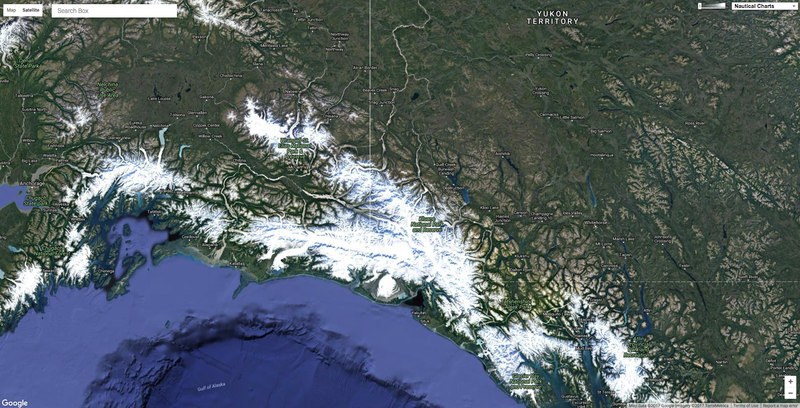 Another of the more intriguing features is the permafrost polygon. A great expanse of these shapes is captured on the floor of the Laptev Sea off the Siberian coast in the Arctic. These were actually created above water in ground that contracted and expanded in multiple cooling and warming cycles - only then to be submerged beneath the waves. They illustrate how the sea can sometimes preserve a record that might otherwise be lost on land, perhaps covered over by vegetation or human development, or lost entirely through erosion. And flicking through the book, it is clear that not all ice action has been constrained to today's polar waters. You will find, for example, images in the atlas from around the UK. But then 25,000 years ago, Britain was covered by a colossal ice sheet that extended down from the north. 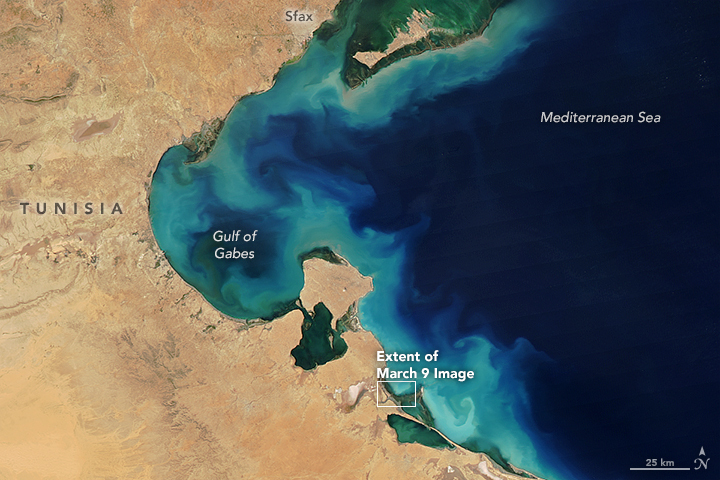 Likewise, Libya makes an entry with glacial lineations in the Murzuq Basin that are several kilometres long. These ice features are present because 450 million years ago, north Africa was centred over the South Pole, forming a part of the Gondwana supercontinent. 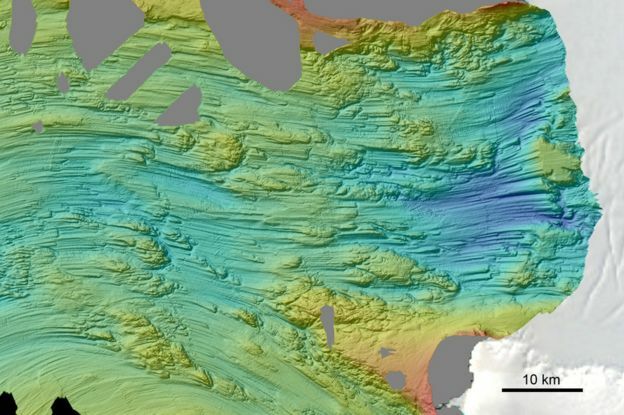 But as impressive as all this imagery is, it still only represents a small fraction of the total seafloor currently found above 60 degrees latitude. As with the ocean more generally across the globe, our knowledge of the shape of bed is poor. If you were to divide the polar seas into 500m boxes, more than 85% of them would have no depth soundings. "That will change in time as all these vessels routinely gather multibeam data," said Dr Hogan. 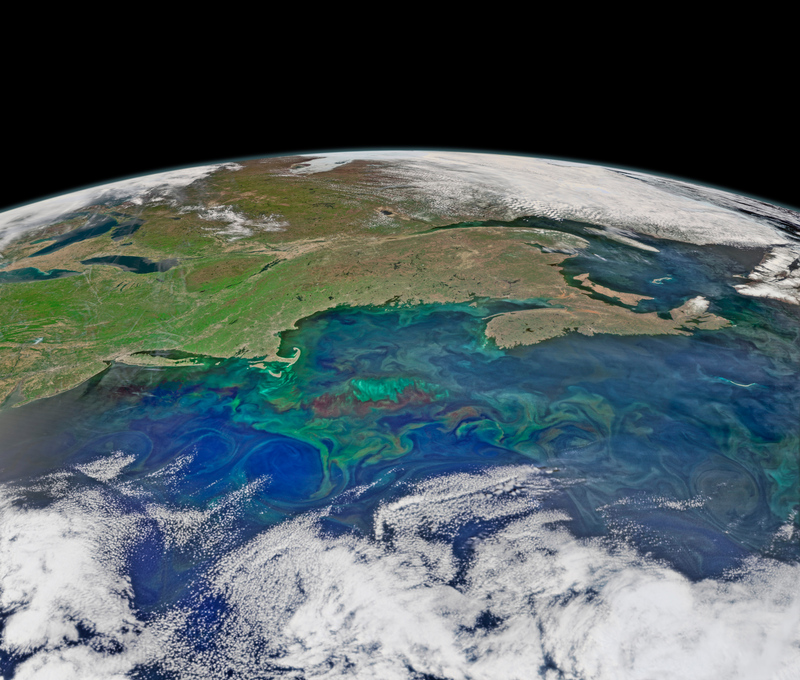 Rising ocean temperatures drive more intense and longer lasting toxic outbreaks. 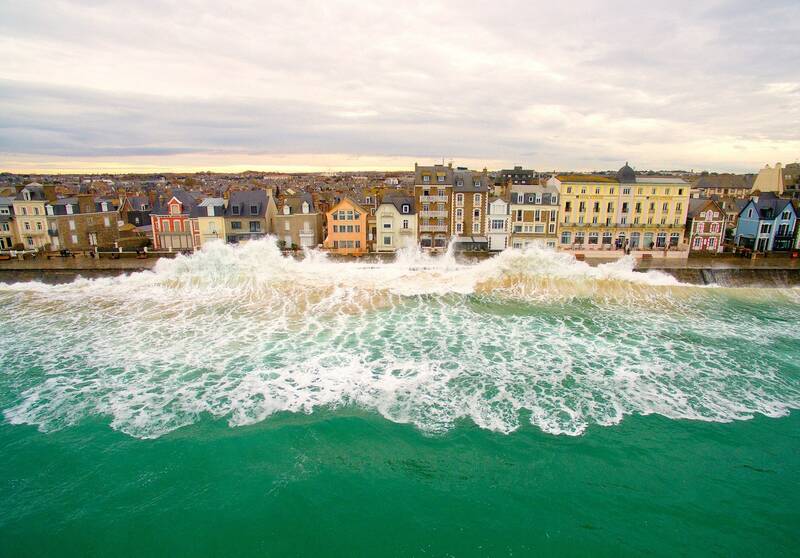 Researchers have long suggested that climate change could mean more damage from algal blooms — runaway growths of algae that can strangle marine ecosystems and devastate coastal economies. Now, a study has unpicked how warming ocean temperatures have already driven an intensification of blooms around North America — the first time this link has been established at an ocean scale. 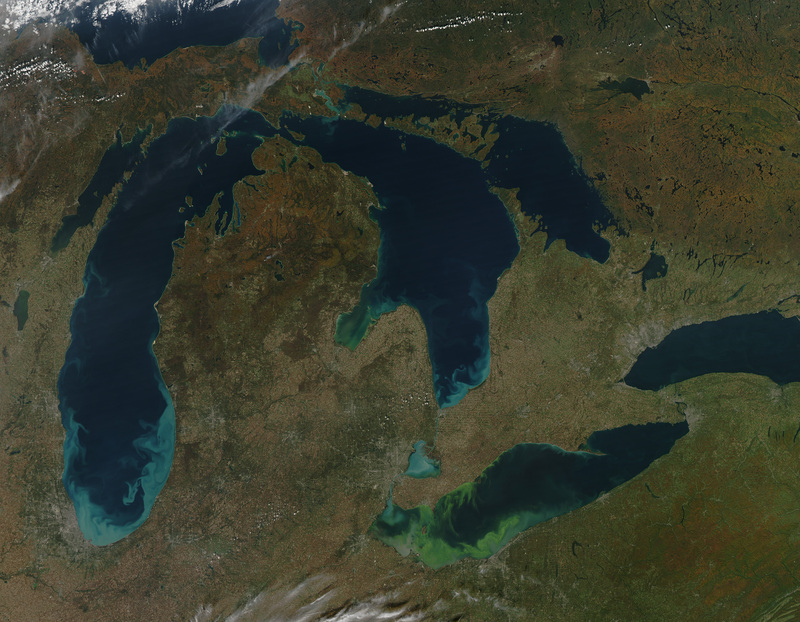 Harmful algal blooms can occur when changes in water conditions lead to a huge growth in the number of a particular species of algae. 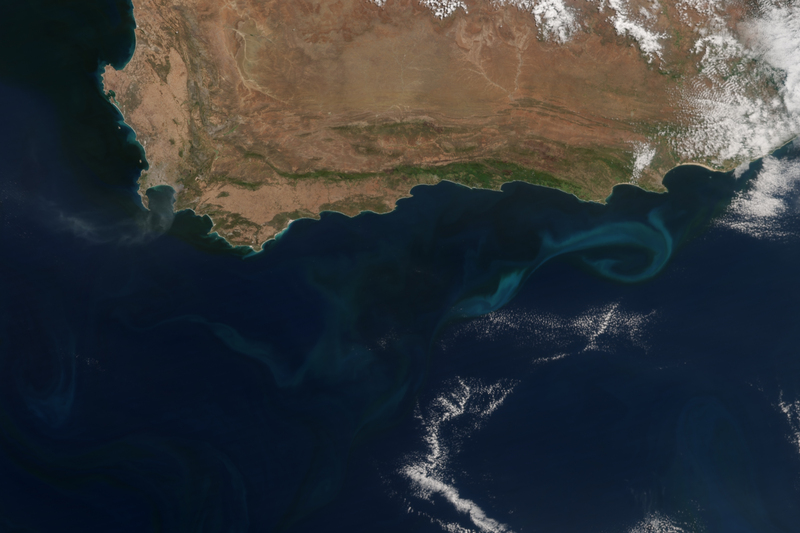 The blooms can produce toxins, become so large that they kill marine life, and even turn water a different colour. Research has established that one factor that helps blooms to spread is a sudden increase in nutrients such as nitrogen and phosphorus — often from agricultural fertilizers — and it has also linked warming temperatures to individual events. But the broader influence of climate change on these outbreaks is less well quantified. Christopher Gobler, who studies coastal ecosystems at Stony Brook University in Southampton, New York, and his colleagues looked at the relationship between blooms in the North Atlantic and North Pacific oceans and temperature changes in the region to investigate whether the events there were linked to were linked to ocean warming. 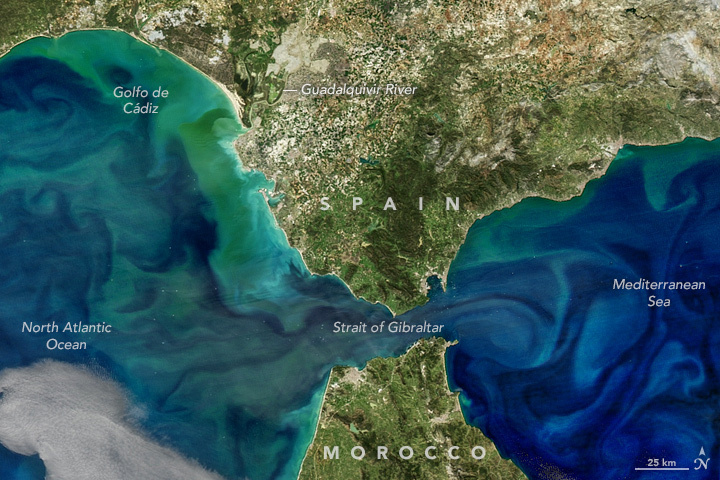 Previous research has studied the influence of climate change on algal blooms in individual coastal systems, says Gobler, but this is the first to assess ocean-basin-wide trends. The researchers looked at two species of algae: Alexandrium fundyense and Dinophysis acuminata. (These species produce toxins that can cause illnesses — sometimes fatal — in humans who eat shellfish contaminated with them). 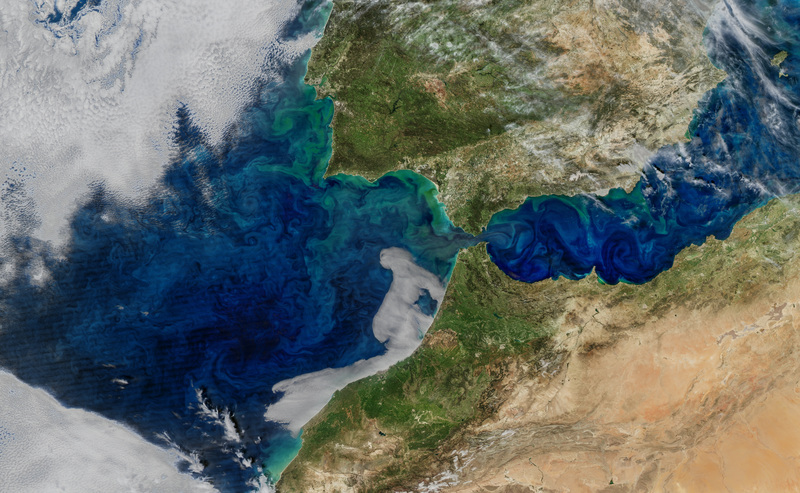 They used detailed data on sea-surface temperatures to model trends in the growth rates of the algae species and the periods when blooms occurred from the early 1980s into the twenty-first century. 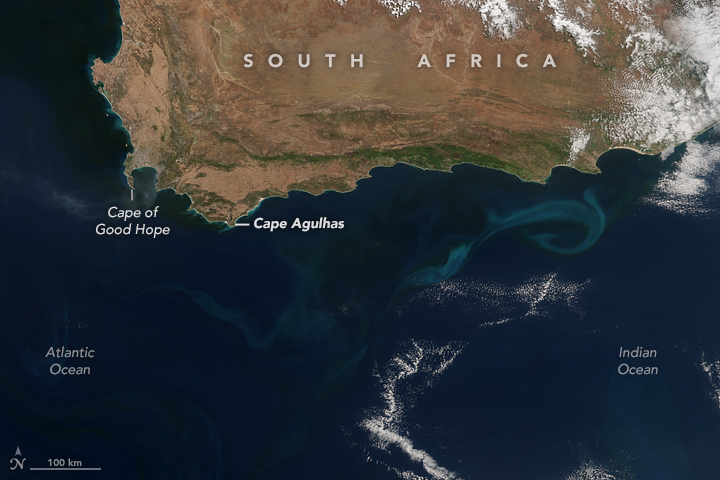 The light blue swirl to the east of Cape Agulhas is a phytoplankton bloom in an area of cool, upwelling water. At dozens of sites, their model suggests that new blooms could occur where they hadn't happened before. The researchers found higher potential growth rates and longer bloom seasons for both species in many parts of the Atlantic coast and along Alaska. In some places, they found the bloom season to now be more than a month longer than it was in 1982. 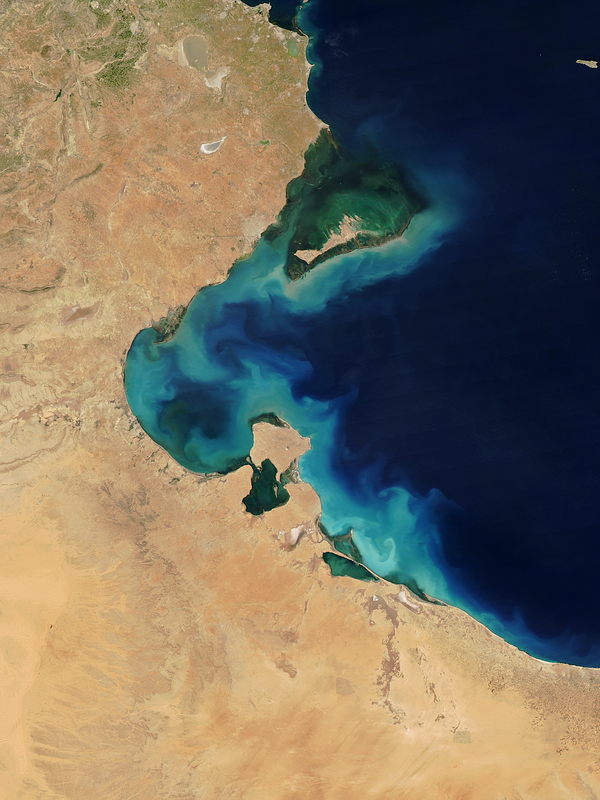 The team used its model to retrospectively predict what harmful blooms might have occurred in the time period and found good agreement with actual events. “What’s different about this study is they’re going beyond just saying 'Look, warmer is bad' and trying to do a rigorous quantitative analysis,” says Anna Michalak, who studies climate change and water quality at the Carnegie Institution for Science in Stanford, California. Gobler points out that that the ocean does not warm uniformly, with some regions warming faster than average and some cooling. This means blooms will appear in new regions, and may actually reduce in some places they currently occur. Factors other than temperature are still clearly important, he says. Michalak points out that for events such as major droughts and floods, researchers can now often estimate how much more likely such events will be as a result of climate change. But there is less research on the relationship between water quality and climate change. “We don’t have that science on the water quality side,” she says, adding that this paper is one step in that direction. 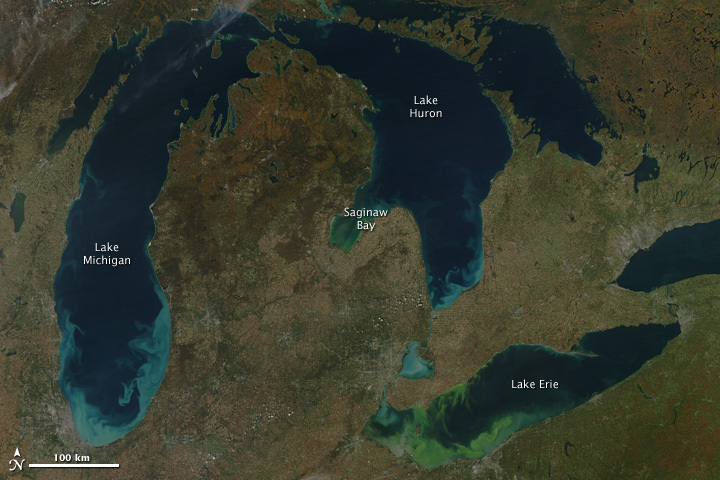 In 2011, North America’s Lake Erie experienced one of its worst algal blooms in decades. 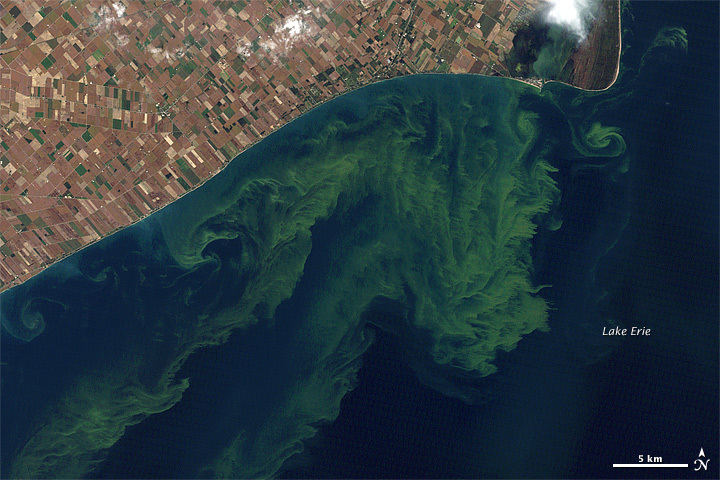 Michalak’s team has previously studied a massive 2011 bloom in Lake Erie — one of the largest ever on the Great Lake. They pinned the event on a combination of weather conditions and agriculture putting huge nutrient loads in the lake. 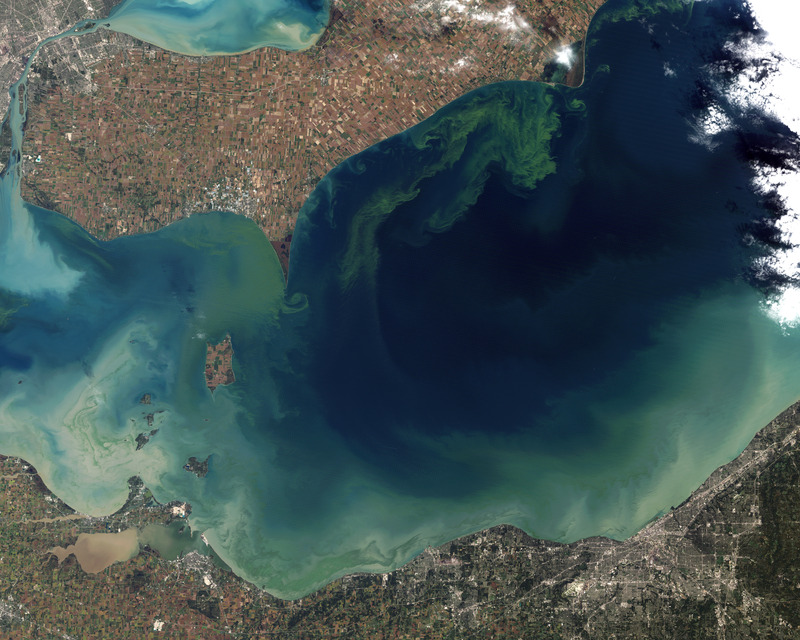 That interplay of different factors is one reason why not everyone is yet prepared to say that climate change will necessarily lead to more harmful algal blooms. Mark Wells, who studies harmful algal blooms at the University of Maine in Orono, points out that that rising temperatures alone may not always cause more harmful algal blooms. 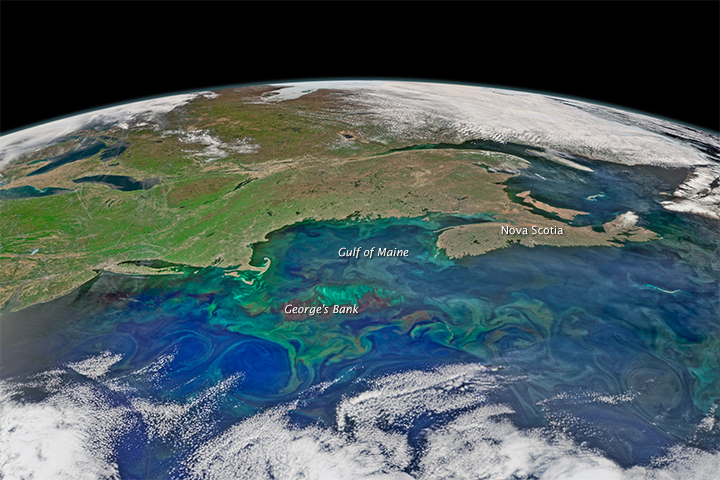 In 2010 in the Gulf of Maine, he says, there were very high water temperatures, and many blooms were expected. But in fact, water temperatures were so high that the layers of sea water became stratified and prevented mixing and the transfer of nutrients, so in the end there were fewer blooms than expected. Still, he says, the latest study “provides a lot of new evidence” and represents a believable trend. A view of the ice canyon that now carries meltwater from the Kaskawulsh glacier, seen here on the right, away from the Slims river and toward the Kaskawulsh river. An immense river that flowed from one of Canada’s largest glaciers vanished over the course of four days last year, scientists have reported, in an unsettling illustration of how global warming dramatically changes the world’s geography. One of Canada's rivers has vanished. The Slims river has been flowing through Canada for 300 years, but in 2016 something happened that caused it to vanish in the blink of an eye. In just four days, the river dipped in height so much that it could not recover. Today, the only evidence of the Slims river is its empty, thirsty channel. Scientists attribute the river's disappearance to our warming climate and predict that future rivers may suffer the same fate. The abrupt and unexpected disappearance of the Slims river, which spanned up to 150 metres at its widest points, is the first observed case of “river piracy”, in which the flow of one river is suddenly diverted into another. For hundreds of years, the Slims carried meltwater northwards from the vast Kaskawulsh glacier in Canada’s Yukon territory into the Kluane river, then into the Yukon river towards the Bering Sea. 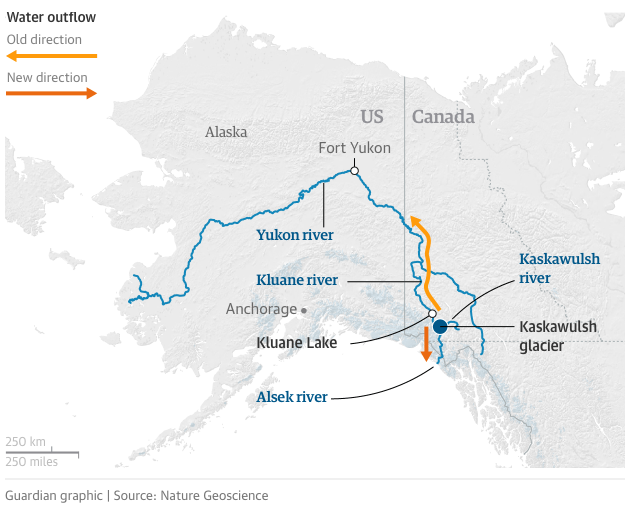 But in spring 2016, a period of intense melting of the glacier meant the drainage gradient was tipped in favour of a second river, redirecting the meltwater to the Gulf of Alaska, thousands of miles from its original destination. The continental-scale rearrangement was documented by a team of scientists who had been monitoring the incremental retreat of the glacier for years. But on a 2016 fieldwork expedition they were confronted with a landscape that had been radically transformed. “We went to the area intending to continue our measurements in the Slims river, but found the riverbed more or less dry,” said James Best, a geologist at the University of Illinois. Climate change is causing thick ice deposits that form along Arctic rivers to melt nearly a month earlier than they did 15 years ago, a new study finds. In the past, river icings have melted out around mid-July, on average. But a new study measuring the extent of river icings in the U.S. and Canadian Arctic shows most river icings disappeared 26 days earlier, on average, in 2015 than they did in 2000, melting around mid-June. In addition, the study found most icings that don’t completely melt every summer were significantly smaller in 2015 than they were in 2000. The team flew a helicopter over the glacier and used drones to investigate what was happening in the other valley, which is less accessible. “We found that all of the water that was coming out from the front of the glacier, rather than it being split between two rivers, it was going into just one,” said Best. is running higher now thanks to the addition of water that used to flow into the Slims River. While the Slims had been reduced to a mere trickle, the reverse had happened to the south-flowing Alsek river, a popular whitewater rafting river that is a Unesco world heritage site. The previous year, the two rivers had been comparable in size, but the Alsek was now 60 to 70 times larger than the Slims, flow measurements revealed. The data also showed how abrupt the change had been, with the Slims’ flow dropping precipitously from the 26 to 29 May 2016. Geologists have previously found evidence of river piracy having taken place in the distant past. A satellite image of the Kaskawulsh glacier and Slims and Kaskawulsh rivers. The yellow lines represent the pre-2016 flow direction of the Slims and Kaskawulsh rivers. Prof Lonnie Thompson, a paleoclimatologist at Ohio State University who was not involved in the work, said the observations highlight how incremental temperature increases can produce sudden and drastic environmental impacts. “There are definitely thresholds which, once passed in nature, everything abruptly changes,” he said. Between 1956 and 2007, the Kaskawulsh glacier retreated by 600-700m. In 2016, there was a sudden acceleration of the retreat, and the pulse of meltwater led to a new channel being carved through a large ice field. 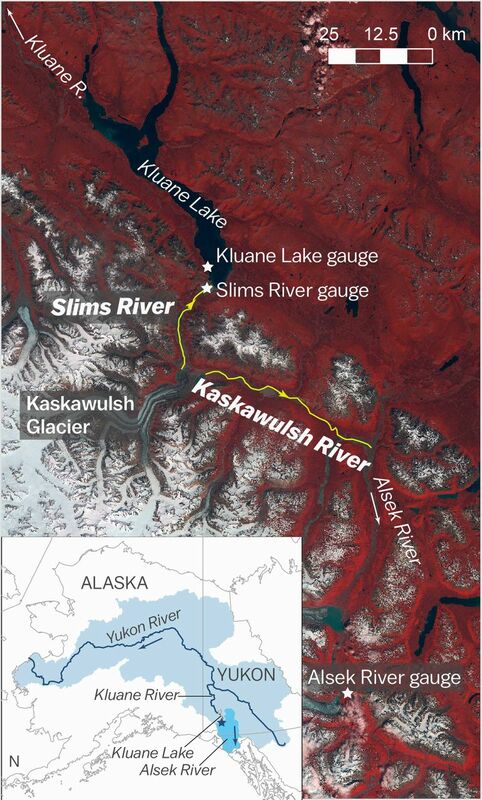 The new channel was able to deliver water to the Alsek’s tributary whose steeper gradient resulted in the Slims headwater being suddenly rerouted along a new southwards trajectory. In a geological instant, the local landscape was redrawn. Where the Slims once flowed, Dall sheep from Kluane National Park are now making their way down to eat the fresh vegetation, venturing into territory where they can legally be hunted. The formerly clear air is now often turned into a dusty haze as powerful winds whip up the exposed riverbed sediment. Fish populations are being redistributed and lake chemistry is being altered. Waterfront land, which includes the small communities of Burwash Landing and Destruction Bay, is now further from shore. Sections of the newly exposed bed of Kluane Lake contain small pinnacles. Wind has eroded sediments with a harder layer on top that forms a protective cap as the wind erodes softer and sandier sediment below. A statistical analysis, published in the journal Nature Geoscience, suggests that the dramatic changes can almost certainly be attributed to anthropogenic climate change. The calculations put chance of the piracy having occurred due to natural variability at 0.5%. “So it’s 99.5% that it occurred due to warming over the industrial era,” said Best. The Yukon region is extremely sparsely inhabited, but future river piracy could have catastrophic effects on towns, villages and ecosystems that have sprung up around available water, according to an analysis accompanying the paper, by Rachel Headley, a geologist at the University of Wisconsin-Parkside. “If a river changes course so drastically that the drainage basin no longer reaches its original outlet, this change might eventually impact human and biological communities that have grown around the river’s original outlet,” she said. Thompson, who has documented glacial retreat on Mount Kilimanjaro, predicts that there will be an acceleration in the observations of river piracy events as glaciers retreat globally. “I think we could see similar divergence in streams in the Himalayas as well as throughout the Third Pole region, the Andes of Peru, other sites in northern Canada and Alaska,” he said. The second draft of the Septentrionalium Terrarum, released in 1606. 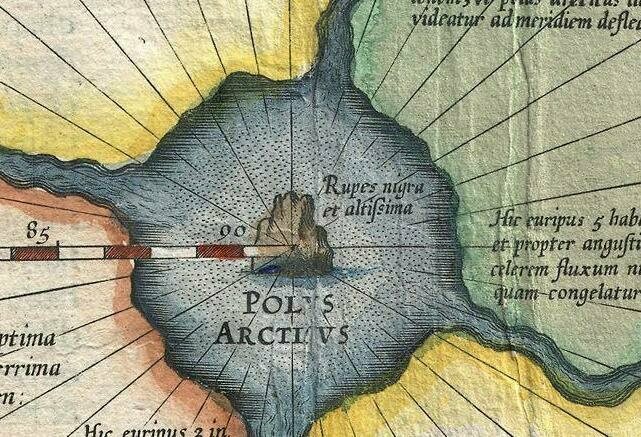 Gerard Mercator’s 16th-century attempt at mapping the Arctic includes such guesses as a giant whirlpool and polar pygmies. These days, climate scientists are looking hard at Arctic maps. As winter sea ice shrinks and cracks appear, they try to understand the reasons for these changes, and determine what we should expect in the future. Centuries ago, though, when people tried to map the Arctic, they weren’t too concerned with what was happening to it—they just wanted to know what the heck was up there. And, if they didn’t know, they pretty much made it up. 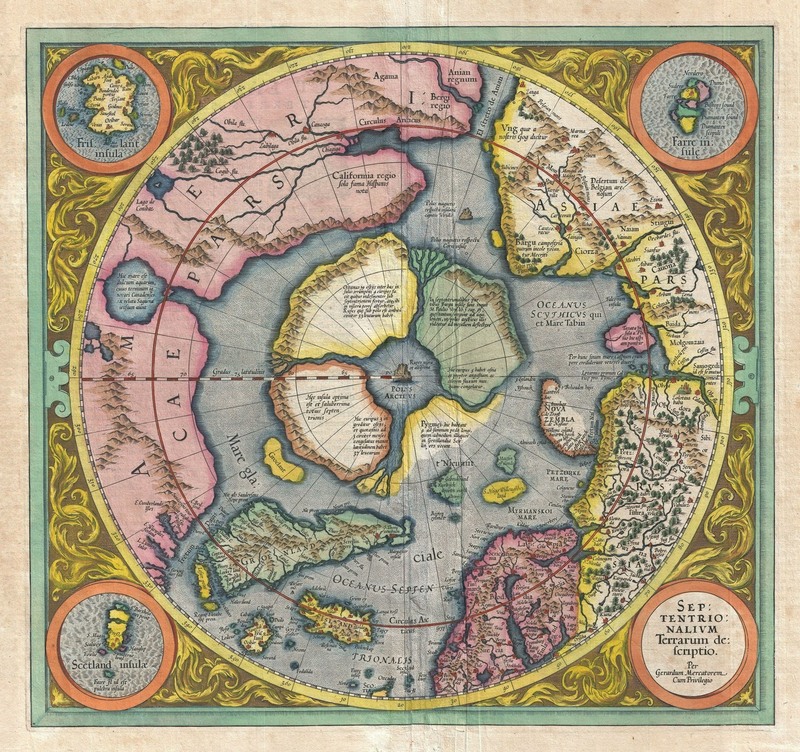 Such was the case with the first known map of the Arctic: the Septentrionalium Terrarum, which is filled with magnetic stones, strange whirlpools, and other colorful guesses. The map’s creator, the Flemish cartographer Gerardus Mercator, is best known for the “Mercator projection,” the now-famed method of taking the curved lines of the Earth and transforming them into straight ones that can be used on a flat map. The Mercator projection was invented for sailors, who, thanks to its design, could use it to plot a straight-line course from their point of origin to their destination. In order to make his map useful for navigation, though, Mercator had to sacrifice accuracy in other areas—specifically, he had to stretch out the top and bottom parts of his map, making the lands and seas in the far North and South appear disproportionately larger than those nearer the equator. Mercator’s 1569 map of the world, the first to feature his famous projection. Under the terms of this Mercator math, the North Pole would appear so large as to be almost infinite. 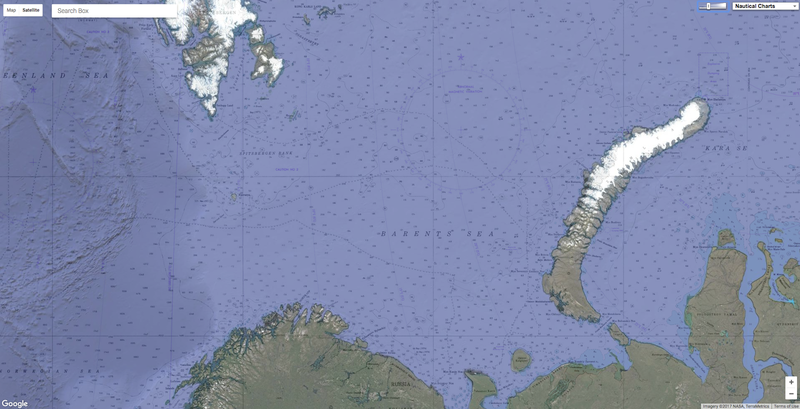 So instead of including it in the overall projection, Mercator decided to set a small, top-down view of the Arctic in the bottom left corner of his world map. Geographical historians consider this to be the first true map of the Arctic. Over the subsequent decades, as new information came to light, Mercator and his protégés enlarged and updated this original map—the draft above is an attempt from 1606, updated by his successor, Jodocus Hondius—but those original bones remained in place. By the 1500s, not very many people had ventured up to the Arctic—no explorer would set foot on the Pole itself until 1909. At the time, many assumed the pole itself featured a giant, magnetic mountain. The presence of this formation was widely accepted at the time. Most people thought it was magnetic, which provided an easy explanation for why compasses point north. 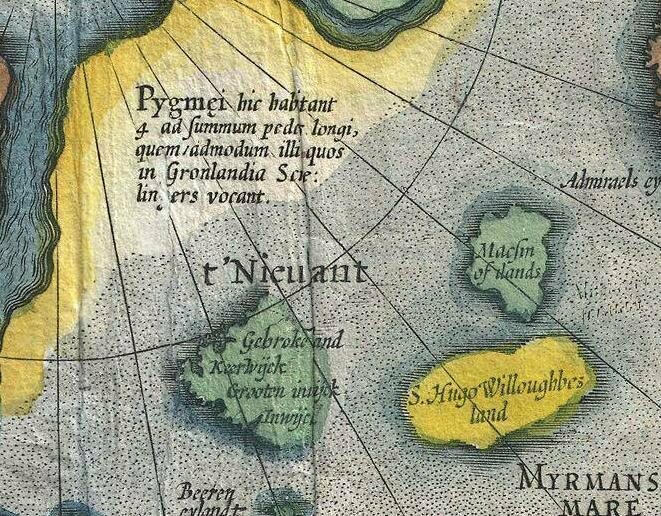 But Mercator was not quite convinced by this argument, and included a different rock, which he labels “Magnetic Pole,” in the top left corner of the map, just north of the Strait of Anián. Mercator draws the Arctic in four large chunks separated by channels of flowing water, which meet in the middle in a giant whirlpool. He got this idea from two 16th-century explorers, Martin Frobisher and James Davis, who each made it as far as what is now Northern Canada. Both documented their experiences with vicious currents, which, they wrote, pulled giant icebergs along like they were nothing. “Without cease, it is carried northward, there being absorbed into the bowels of the Earth,” Mercator wrote on his original map. Each piece of the Arctic also has particular qualities. According to Mercator’s labels, the one in the lower right is supposedly home to “pygmies, whose length is four feet”—likely another reference to the Inventio Fortunata, which described groups of small-statured people living in the polar regions. The one next door, on the bottom left, is apparently “the best and most salubrious” of all the chunks, although no evidence is given to support this—or to explain why the pygmies wouldn’t want to live there, instead. 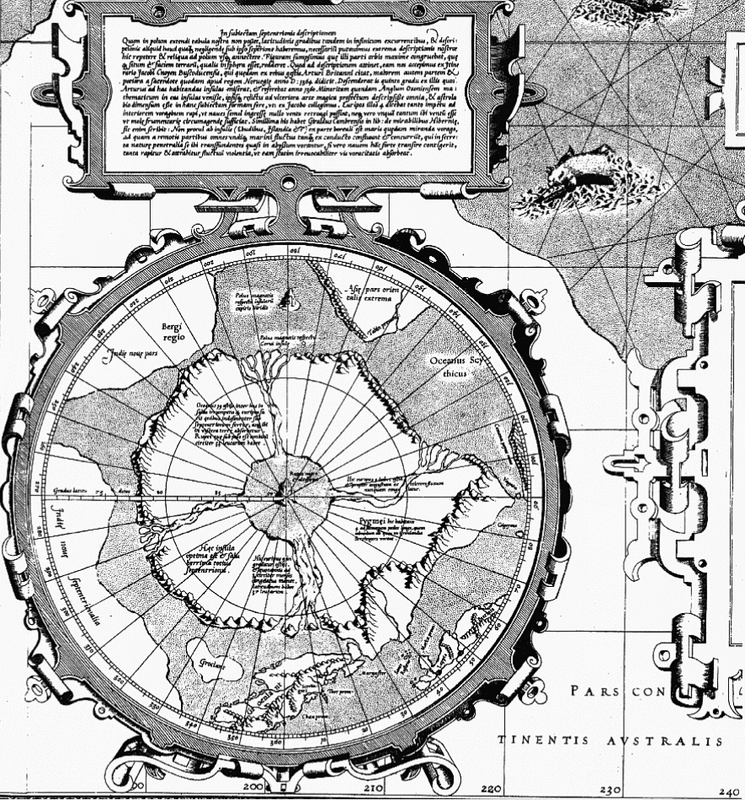 After Mercator died in 1594, explorers continued to gain new knowledge of the Arctic, and cartographers revised their view of both Poles. By 1636, up-to-date maps of the region lacked Mercator’s four regions, along with the Rupus Nigra and the central whirlpool. Instead, they showed one large piece of land, surrounded by smaller islands and, often, adorned with the ship’s routes that enabled this geographical knowledge in the first place. As we peer at modern Arctic maps, wondering what changes are ahead, it’s fascinating to think back to Mercator’s original version, mysterious and broken from the beginning.